Finding a suitable location is never an easy task for a film-maker, especially when, as a writer-director, you have such preconceived ideas of what it is that you’re looking for in the first place – in fact, you’re very fortunate indeed if you can find a location that will perfectly match those visual images you had in your head when you began the process. And this is the position I found myself in, when I was struggling to find a suitable location for my latest project, a small-scale British feature film entitled “Heavy Duty”. The story, a thriller, revolves mostly around the one location – a large wood. I thought I’d found the perfect location, but at the last minute discovered that foresters were shortly due to arrive with chainsaws and other equipment, and so I was forced to look elsewhere for an alternative solution. With only a few weeks to go before shooting was scheduled to commence, things began to get desperate, and a certain degree of panic set in. My assistant came across the Woodlands website, and decided to make an enquiry about the possibility of filming in one of their woods – a bit of a long shot, but things were pretty desperate by this stage, and we were running out of options. To my surprise, an e-mail came back very soon after, and Daniel Sharp asked me to phone to discuss my requirements. We ended up having a fairly lengthy chat, and Daniel came up with several woods that he thought, having heard my ideas, would fit the bill. It’s usually quite a feat to get films made in the UK, so I was very relieved that he was prepared to even discuss the matter, let alone go out of his way to make suggestions. I arranged to see Sulis Wood and Warleigh Wood a few days later. 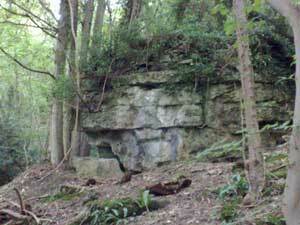 Having arrived at Sulis Wood, I was immediately struck by the beauty of its rock formations and the rich diversity of the landscape. Everywhere you looked, there was something that was visually stimulating – from moss-covered stones to large, jagged rocks that protruded from the steep slopes. Within minutes of arriving, I could already see potential sites for the scenes in the script. You didn’t have to walk far before the scenery would change yet again, and suddenly I found myself being inspired by yet another visual feast. Warleigh Wood was no less exciting in terms of its visual surprises. The path that runs through this wood provides perfect access to various clearings, and makes it easy to explore the wood in all directions without losing your bearings. 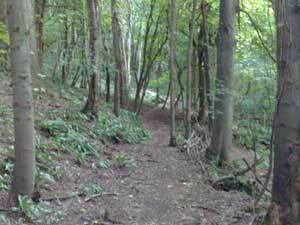 As in Sulis Wood, there are plenty of surprises, and no shortage of potential scene sites – you really are spoilt for choice, and I didn’t think that would be the case. I had explored other woods prior to these visits, but just hadn’t found what I was looking for – both woods were an amazing discovery, and I’m really indebted to Woodlands.co.uk and to Daniel Sharp for his suggestions, and his contribution to the making of this film. Great news that you found somewhere Rhys,that’s the beauty of these forums, they bring people together in a way no other medium can.